The sarcomeric z-disc, a structure tradionally believed to simply crosslink myofilaments, is emerging as a “hot spot” for cardiomyopathy disease genes, including muscle-LIM protein (MLP), cypher/ZASP and T-Cap/telethonin. Moreover, it provides an important link between structural proteins and cardiomyocyte signaling. We have recently identified a novel protein family of muscle-specific z-disc proteins, termed calsarcins, which directly interact with cypher/ZASP and T-Cap/telethonin. Calsarcins also bind the phosphatase calcineurin, which plays a critical role in the transduction of calcium signals leading to cardiomyopathy. We have now generated calsarcin-deficient mice, which reveal a cardiomyopathic phenotype in response to biomechanical stress (Fig.1). More than 20 other proteins associate with the z-disc and tuhs represent excellent candidate genes fpr human DCM. However, many of these have not been systematically analyzed for theit molecular interactions. Moreover, it is believed that several components of the complex z-disc are still unknown. Fig. 1:	Calsarcin-deficient mouse heart (right), displaying dilated cardiomyopathy in response to aortic banding. A wildtype heart (left) subjected to banding served as control. In a complementary approach, we plan to characterize novel genes with a potential role in disease pathways. During NGFN1 we found a set of >100 novel/uncharacterized ESTs to be differentially regulated in human DCM and/or experimental cardiomyopathies, such as calcineurin-trangenic mice, calsarcin-1 knock-out mice, and Troponin T transgenic rats. The second specific aim was to systematically analyze these clones in vitro utilizing semi-automated assays (in close cooperation with SMP Cell). These experiments allow to simultaneously examine a large number of candidates for their basic properties, including effects on cell growth, cell death and selected signal transduction pathways as well as the determination of their subcellular localization in muscle cells. The third specific aim will be to characterize promising ESTs (e.g. with a muscle-specific expression pattern) in detail by yeast-two-hybrid screens with cardiac cDNA libraries, siRNA-mediated “knock-down” in neonatal cardiomyocytes (including subsequent microarray analyses) and the generation of loss of function mutations in zebrafish. A subset of the most interesting molecules (e.g. those that are associated with cardiomyopathy in zebrafish) will also be studied in mouse models, either by transgenesis or generation of “knock-out”-models. Finally, the fourth specific aim will be to test novel genes that reveal a cardiomyopathic phenotype in animals for mutations in the DCM patient cohort. 1. Frey N, Barrientos T, Shelton J, Frank D, Rütten H, Gehring D, Kuhn C, Lutz M, Rothermel B, Bassel DubyR, Richardson JA, Katus HA, Hill JA, Olson EN. Mice lacking calsarcin-1 are sensitized to calcineurin signalling and display accelerated cardiomyopathy in response to pathological biomechanical stress. Nat. Med. (2004) 10, 1336-43. 2. Frey N, Katus HA, Olson EN, Hill JA. Hypertrophy of the heart: A new therapeutic target? Circulation (2004) 109:1580-9. 3. Frey N, Olson EN. Cardiac hypertrophy. The good, the bad, and the ugly. Annu Rev Physiol. (2003) 65:45-79. 4. Frey N, Olson EN. Calsarcin-3, a novel skeletal muscle-specific member of the calsarcin family, Interacts with multiple Z-disc proteins. J. Biol. Chem. (2002) 277: 13998-14004 . 5. 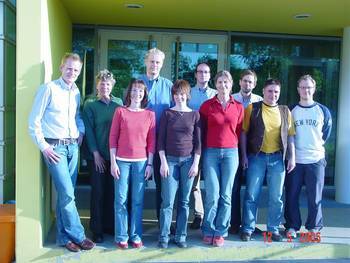 Antos CL, Frey N, Marx SO, Reiken S, Gaburjakova M, Richardson JA, Marks AR, Olson EN. Dilated cardiomyopathy and sudden death resulting from constitutive activation of protein kinase A. Circ. Res. (2001) 89: 997-1004. 6. Frey N, Olson EN. Making matters worse for a broken heart. J. Clin. Invest. (2000) 106: 1437-1439. 7. Frey N, Richardson JA, Olson EN. Calsarcins, a novel family of sarcomeric calcineurin-binding proteins. Proc. Natl. Acad. Sci. USA (2000) 97: 14632-14637. 8. Frey N, McKinsey TA, Olson EN. Decoding calcium signals involved in cardiac growth and function. Nat. Med. (2000) 6: 1221-1227. 9. Frey N, Franz WM, Gloeckner K, Degenhardt M, Müller M, Müller O, Merz H, Katus HA. Transgenic rat hearts expressing a human cardiac troponin T deletion reveal diastolic dysfunction and ventricular arrhythmias. Cardiovasc. Res. (2000) 47: 254-264. 10. Frey N, Brixius K, Schwinger RHG, Benis T, Karpowski A, Lorenzen HP, Lüdde M, Katus HA, Franz WM. Alterations of Tension-Dependent ATP-Utilization in a Transgenic Rat Model of Hypertrophic Cardiomyopathy. In Revision (2006). 11. Frey N, Barrientos T, Frank D, Bezprozvannaya S, Bassel-Duby R, Richardson JA, Olson EN. Two novel members of the ABLIM protein family, ABLIM-2 and -3, associate with STARS and synergistically activate SRF-dependent transcription. Submitted (2006). 12. Rosenberg M, Lorenz HM, Gassler N, Katus HA, Frey N. Rapid progressive eosinophilic cardiomyopathy in a patient with Churg-Strauss syndrome (CSS). Clin. Res. Cardiol. (2006) In press. 13. Frank D, Kuhn C, Katus HA, Frey N. The sarcomeric Z-disc: A nodal point in signalling and disease. J. Mol. Med. (2006) In press. 14. Luedde M, Katus HA, Frey N. Novel molecular targets in the treatment of cardiac hypertrophy. Recent Pat. Rev. Cardiovasc. Drug Discov. (2006) 1: 1-20. 15. Grünig E, Tasman JA, Kücherer H, Franz WM, Kübler W, Katus HA. Frequency and phenotypes of familial dilated cardiomyopathy. J. Am. Coll. Cardiol. (1998) 31, 186-194. 16. Clark KA, <?xml:namespace prefix = st1 ns = "urn:schemas-microsoft-com:office:smarttags" />McElhinny AS, Beckerle MC, Gregorio CC. Striated muscle cytoarchitecture: an intricate web of form and function. Annu. Rev. Cell. Dev. Biol. (2002) 18, 637-706. 17. Knoll R, Hoshijima M, Hoffman HM, Person V, Lorenzen-Schmidt I, Bang ML, Hayashi T, Shiga N, Yasukawa H, Schaper W, McKenna W, Yokoyama M, Schork NJ, Omens JH, McCulloch AD, Kimura A, Gregorio CC, Poller W, Schaper J, Schultheiss HP, Chien KR. The cardiac mechanical stretch sensor machinery involves a Z disc complex that is defective in a subset of human dilated cardiomyopathy. Cell (2002) 111, 943-55. 18. Frey N, Olson EN. Calsarcin-3, a novel skeletal muscle-specific member of the calsarcin family, interacts with multiple Z-disc proteins. J. Biol. Chem. (2002) 277, 13998-14004. 19. Molkentin JD, Lu JR, Antos CL, Markham B, Richardson J, Robbins J, Grant SR, Olson EN. A calcineurin-dependent transcriptional pathway for cardiac hypertrophy. Cell. 1998;93:215-28. 20. Frey N, Olson EN. Cardiac hypertrophy: The Good, the Bad, and the Ugly. Annu. Rev. Physiol. (2003) 65, 45-79. 21. Wiemann S, Bechtel S, Bannasch D, Pepperkok R, Poustka A and The German cDNA Network. The German cDNA Network: cDNAs, functional genomics and proteomics. Journal of Structural and Functional Genomics (2003) 4, 87-96.